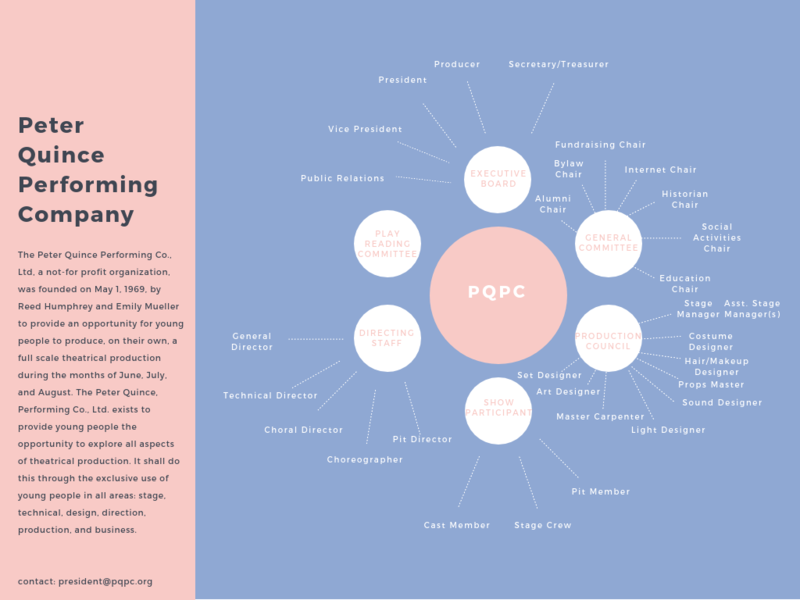 About PQPC - PETER QUINCE PERFORMING COMPANY, LTD.
Peter Quince is a nonprofit theatre company, recognized as charitable organization, which exists for the purpose of providing young people with the opportunity to take on responsibility and leadership at an early age. All of our members are between the ages of 12 and 23: from the board of directors to the production staff to the actors and musicians. Peter Quince was founded in 1969 by Reed Humphrey who wanted to share the magic of theatre with the youth of Manitowoc. Almost half a century later, Peter Quince thrives on the dedication and spirit of its many members. We continue to seek challenges, set goals, and strive to accomplish. Is Peter Quince a person? "Peter Quince" is a character in Shakespeare's Midsummer Night's Dream. He leads an acting troupe composed of his friends to entertain the royalty. He worked under stressful and adverse conditions much like theatre groups today. How does Peter Quince support itself? There is no hidden board or group of adults providing Peter Quince with funding or instructions. We operate independently, conducting our own fundraisers, selling ads, and seeking out sponsors and grants. However, Peter Quince could not survive without the donations and generosity of the community members.